I watched Chris Goode in Mirabel at Ovalhouse Theatre . 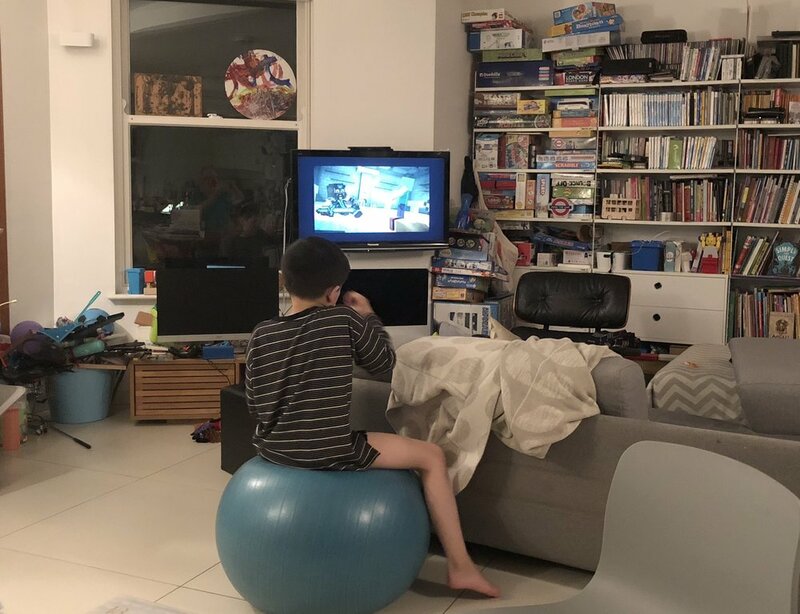 My ASD son is dancing, half dressed, on a yoga ball and hum-singing the tune of the Wii Sports Resorts jingles while watching screen shots of Minecraft Story Mode snapped by him and beaming on the TV via an ipad. Both are interwoven scenes of joyously sad unbearably funny bleak hopeful slices of humanity - a form of intimate theatre. I took a 9 year break from watching much performance as my energies went to my family. There are lines that connect our life. Chris Goode programmed one of my first theatre pieces in the Camden People’s Theatre space. Ovalhouse was the space for my piece, Yellow Gentlemen. Lines that thread our life reflect back on viewing and seeing. and I’m swept somehow into a memory of Speed Death of the Radiant Child. In the caesura of 9 years - I think and work almost every day on investing and further back I work with Andrew P. who goes on to work in the same team as Rebecca McCutcheon in Citi in the life of the City - and so the thread comes round again as Becs deftly directs the play - and has made much theatre in-between. And my thoughts spin back to Mirabel. I am not a critic. As a some time practitioner, wandering back to making - I note the beguiling haunting beautiful sound design, the equally beguiling haunting beautiful set and light - the astonishing animation - these matters so integral, oft reported fleetingly if at all by critics. I’d have liked to sat in the space. Some sound playing. Some lighting. The animation playing again. Chris’ presence fills the space. He starts to tell a story. Fairytale-like. Mirabel, 8 years, wakes up after the end of the world with Bear - soon Wolf - and sets off to find a grown-up. This quest arc journey allows all kinds of themes imageries and characters to populate a dystopian landscape with an all pervading spoken-word—poetry-humourous-sad-story telling of loss, refusal and acceptance. Did I need a coda to find out that vigil and vigilance are the same word, like a vigil’s more than just not going home? On this night, I’m not sure - the echo of loss was perhaps enough; on another night I’m sure the tightening of loose ends would be satisfying. The shuddery conflicted loss - the hopeful questing acceptance - the inevitability of dying yet living on in the memory. Some notes from listening to the literary manager of the Royal Court, Chris Campbell.